These barrels were made to hold liquid, after all they have been full of whisky for the past 6 - 21 years. Make sure you read the information below on how to use a wood product to hold water. Shown price includes shipping to a commercial address in your zip code. Contact us for a shipping discount on two or more barrels. If you want your wood bucket or barrel to hold water, you need to understand that once you have the wood soaked thoroughly, do not allow the bucket or barrel to dry out, keep it full of liquid at all times so that the wood stays tight. When you think of Kentucky, two things come to mind, horses and whisky (it can be spelled whisky or whiskey). Most of the liquor consumed world wide comes from a white oak barrel made in Kentucky. Some 1/2 million barrels are produced in Kentucky each year. These barrels can only be used once for the making of sour mash or bourbon whisky. Some of these barrels make their way to other liquor distilleries such as Tequila, Rum, Scotch, Irish, and Canadian whisky. The white oak barrel is charred by open flame. As the whiskey ages inside the barrel, the wood contracts and expands with changes in the surrounding climate. The whisky is allowed to move in and out of the wood with these changes, this mixing gives the whisky a smoky flavor and an amber tint. Like wagon wheels, barrel making is an art and must have the human touch, computers just can't get the job done. That is what makes each barrel unique and a small work of art unto itself. The used barrels we feature are hand made white oak Kentucky and Tennessee whisky barrels. They have been used ONE TIME to produce whisky and are purchased from the distilleries. These barrels have the marks and ware of being stored in warehouses for 6 - 21 years. Weight: 95 - 110 lbs. 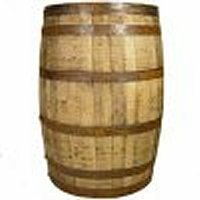 Head hoops: 2" x .071"
Quarter and bilge hoops: 1 1/2" x .071"
Used Kentucky-Tennessee Whisky Barrel, Price Includes Shipping to the Eastern Half Of U.S.$264.95. CLICK IMAGE TO ORDER! Used Kentucky-Tennessee Whisky Barrel, Price Includes Shipping to the Western Half Of U.S.$294.95. CLICK IMAGE TO ORDER!